After every birthday party for my kids, we say, "Wow, we did too much and we'll never do that again." That's not from the typical craziness that exist at every kid birthday party, it's from whatever we ended up making. We always seem to make something for each party. In this case, the kid in question was getting old enough that we didn't need a "theme" and the kids were going to have lots of energy. 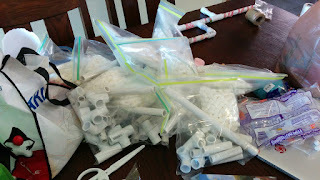 We had been to the MakerFaire earlier in the year and picked up some marshmallow shooters. 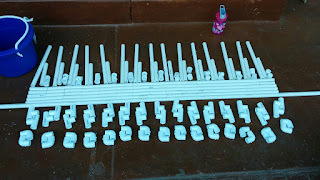 We knew other kids would have fun using them, and we liked the idea of the kid making something themselves. 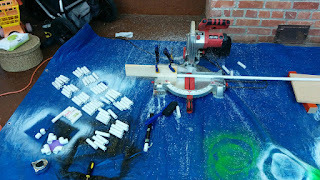 I essentially copied the design from what we got at MakerFaire and made an assembly line. Stops clamped on the saw really helped cranking out cuts. We packaged them up in little baggies. It was then up to each attendee to assemble them. We didn't provide any directions except for an example model. Most kids got it, and it was great seeing them help each other. 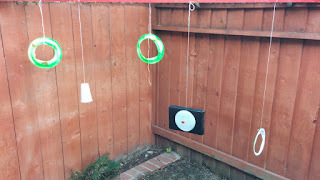 I had the birthday girl assemble the baggies and make targets for target practice. It was pointless though, because the kids (obvious in retrospect) just shot at each other. 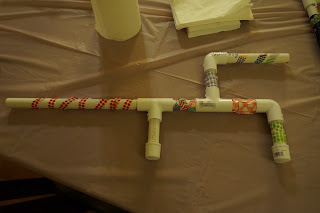 We also had the kids personalize their shooters.